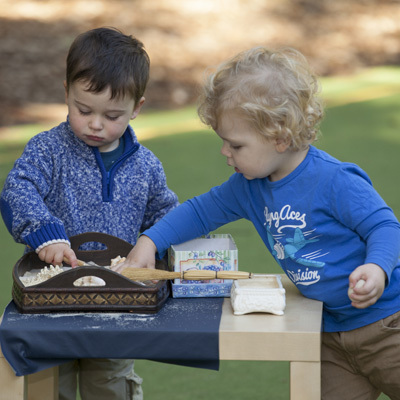 Dr. Maria Montessori determined that early learning for children could be categorised into the key areas of practical life, sensorial, language, movement, cultural, grace and courtesy. The Stepping Stones Montessori Long Day Care prepares the infant and toddler learning spaces so that they are set up sequentially in these key areas. 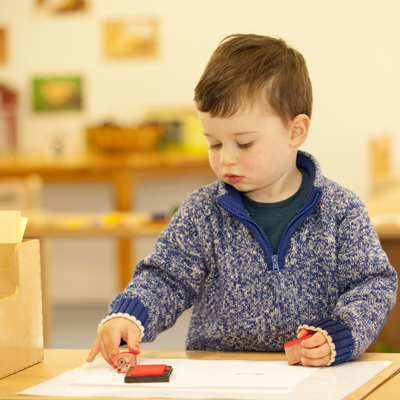 These exercises and experiences form the foundation of the Montessori classroom. 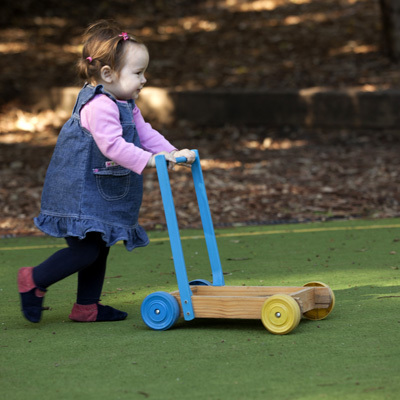 Activities such as sweeping, sewing, food preparation and polishing enable the child to participate in daily life and promote the development of concentration, hand-eye co-ordination and muscular control. Constant repetition strengthens the child’s muscles and creates confidence in a particular skill. The classroom activities satisfy the need for meaningful activity. They also satisfy the need for imitation which is a strong urge during these early years. The young child learns to understand the world around him through his senses. Each of the materials isolates one defining quality and assists the child in grasping abstract concepts like weight, length, colour and shape through emphasis of that quality. The environment is full of activities that stimulate the senses. The child at this stage has a natural sensitivity for language development and a never-ending fascination for words. The materials are designed to encourage the acquisition of new vocabulary and to promote muscular control for writing. The indirect preparation of the materials leads the child to the moment when he “explodes” into writing and reading. Maria Montessori explained that humans have a tendency for movement which begins in the womb itself. Accordingly the prepared environment for infants and toddlers has been specially created to aid movement in the child since every action extends the child’s development of fine and gross motor skills, builds physical strength and stamina, enhances perceptual motor skills, improves attention span and circulation while helping to maintain muscle tone. The cultural equipment exposes the child to the world through materials in geography, botany and science. Children are also given the opportunity to experience and create in cultural areas such as art, craft, drama, music and dance. These activities enable them to develop their imaginative responses and their creative self-expression. Children are taught, through modeling and role-playing, the steps required to build awareness and responsiveness towards those around them. Never let a child risk failure until he has a reasonable chance of success. A child’s work is to create the man he will become. An adult works to perfect the environment but a child works to perfect himself. The child can only develop by means of experience in his environment. Movement is another of the child’s great acquisitions. The child who has never learned to act alone, to direct his own actions, to govern her own will, grows into an adult who is easily led and must always lean upon others. the image of human dignity, which is derived from a sense of independence. A place of beauty,simplicity and order. A place where they feel secure to trust their own powers. Focus on the child’s needs within the context of family by recognising and responding to the unique influence that a family has in a child’s life; by working in partnership with families in meeting the child’s individual needs. Copyright © 2019 Stepping Stones Montessori Long Day Care.